Description Apply or remove NMO correction to gathers. 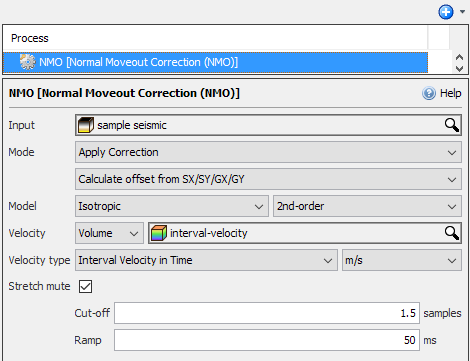 Normal Moveout (NMO) Correction applies or removes moveout calculated from a supplied velocity model. 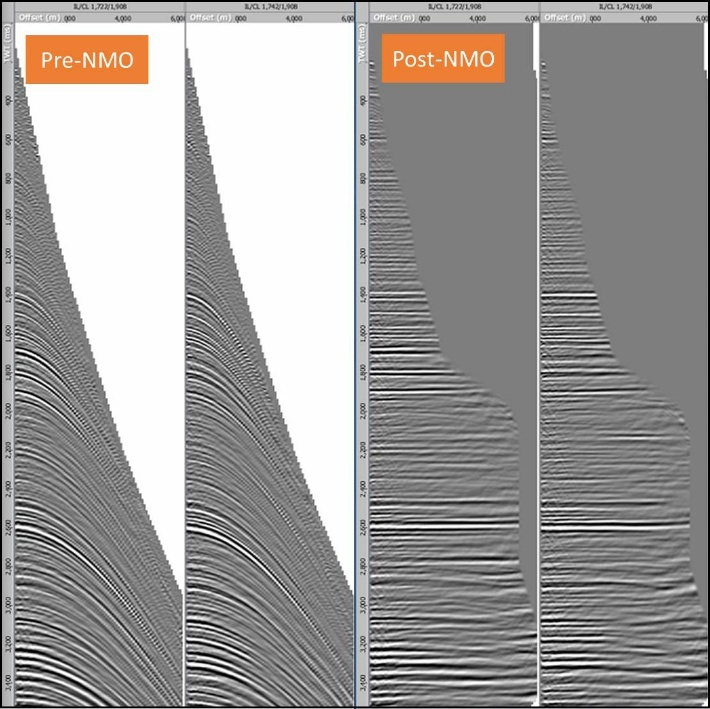 Some processes, such as Q-Filter, are travel-time dependent and require NMO uncorrected gathers. Use this process to remove NMO correction prior to running the filter, then reapply NMO correction afterwards. At Input, select a volume in which the NMO will be applied. Both 2D and 3D gather volumes are supported in this process. In the Details Panel at Mode, select to either Apply NMO Correction or Remove NMO Correction. Then choose to either use the offset header or calculate offset from the source and receiver positions (SX/SY/GX/GY). At Model, select Isotropic NMO (2nd order), Isotropic NMO (4th order) or Anisotropic VTI (Vertical Transverse Isotropy) correction. At Velocity, choose to either use a Volume or a Constant. If you are using a volume, select the velocity volume to be used in the process. Likewise, if you have chosen to use a constant, type the value into the adjacent box. If the velocity provided is insufficiently deep, it will automatically be extrapolated downward. Select the format and units of the velocity to be used in the process at Velocity type. Available options include Interval Velocity in Time, RMS Velocity, Depth values sampled in Time (ZT) and Average Velocity in Time. If you have chosen an anisotropic model, select to use a volume or a constant for the corresponding eta (η). Select the Stretch mute check box to apply a stretch mute. Cut-off (samples) — The amount of stretch beyond which a sample will be muted. Ramp (ms) — The length of the linear mute ramp. 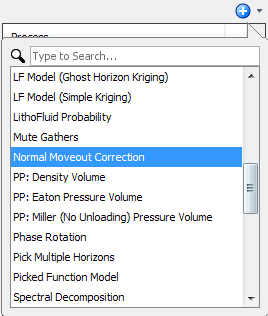 As a result of this process, a new normal moveout correction volume is available in the Volume tab.